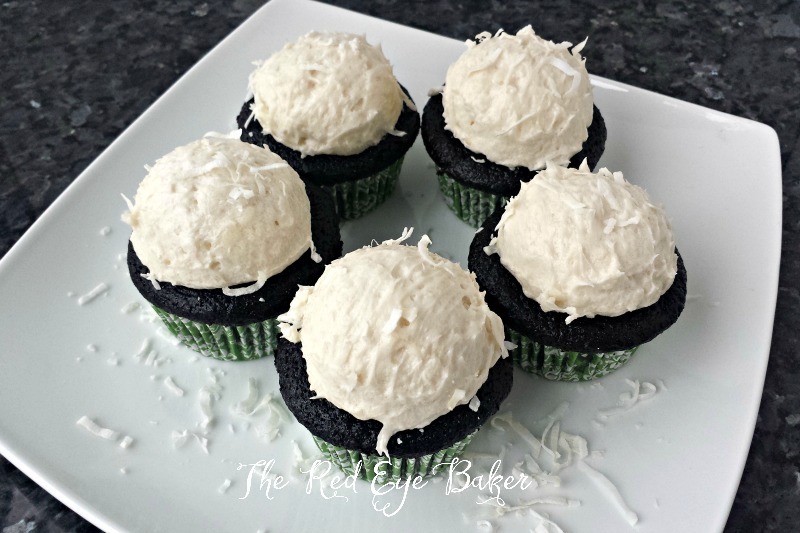 My original inspiration for these cupcakes actually came when my kids were taking out all the Almond Joys from their Halloween candy buckets saying, “Mom, you want these?” I never used those Almond Joys, instead I decided to simply go with Dark Chocolate Coconut Cupcakes. Yes, the frosting is delish! Don’t be alarmed by the ingredient list… you read that right, there IS flour in the recipe. I promise, it’s very good. I first came across this frosting recipe on The Pioneer Woman’s website. The post was “That’s the Best Frosting I’ve Ever Had“, I thought whatever kind of frosting could that be? What makes it so different? The first time I made it I was in love. It’s definitely a great addition to my buttercream arsenal. It’s like a happy medium between a Swiss meringue buttercream and whipped cream. It’s just good! You guys will have to let me know if you’ve ever made this frosting before and what you think? The cake is super easy… just one bowl needed. I used one of my tried and true recipes and made sure to use Hershey’s Special Dark cocoa. 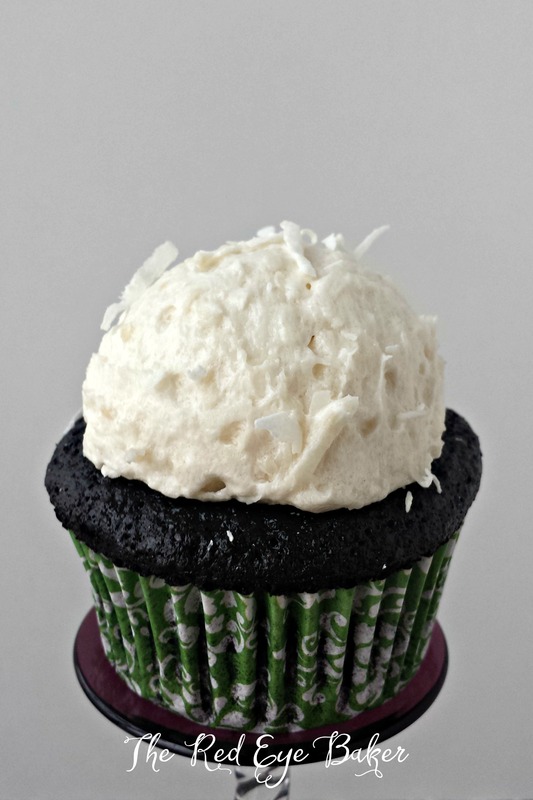 Oh, and I almost forgot… I mixed in some coconut flakes into the frosting too. YUM! 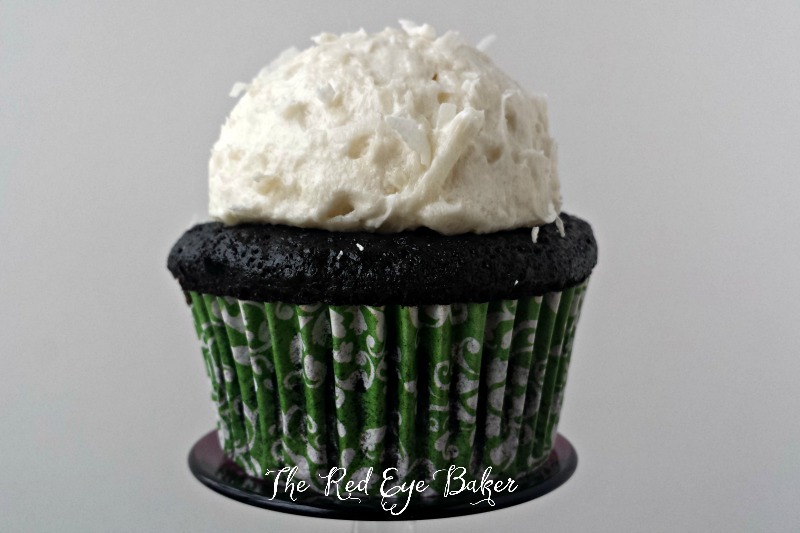 With that I didn’t even need to breakout my piping bag… I just used an ice cream scoop and scooped a perfect mound of the frosting on each cupcake. 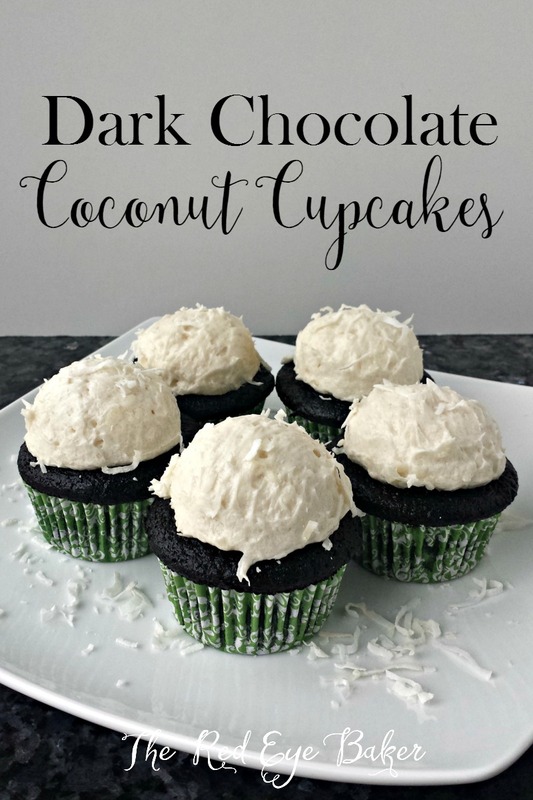 If you or someone you love are fans of the dark chocolate coconut flavor combo, these cupcakes won’t disappoint! Love coconut? Try these Oatmeal Magic Cookie Bars. 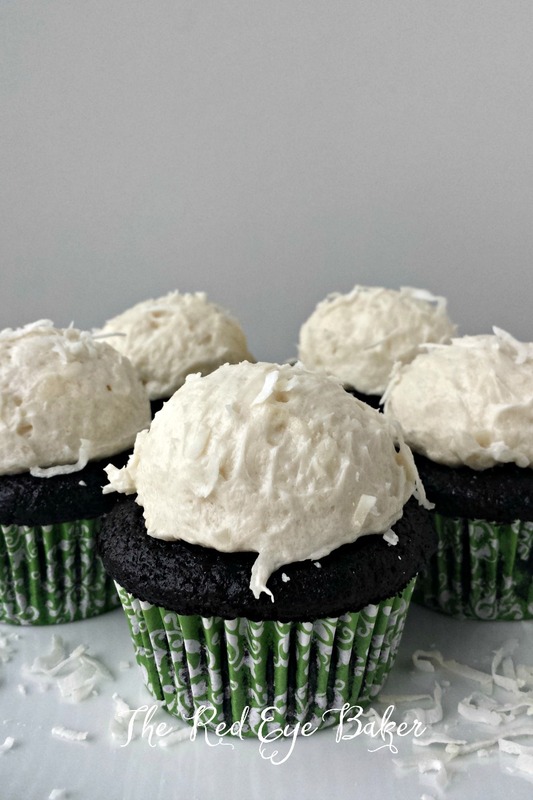 Dark chocolate cupcakes topped with a perfect mound of coconut frosting that’s filled with flaked coconut. A coconut lovers dream! Preheat oven to 350 degrees and line a cupcake pan with liners. Before beginning the cupcakes, mix the coconut milk and flour together in a small saucepan. Place the pan over medium heat, whisk constantly until the mixture gets very thick. Remove it from the heat, mix in the extracts and place it into the fridge to cool. Onto the cupcakes… In large bowl (or in a stand mixer), combine the flour, sugar, cocoa, baking powder, baking soda, salt, and instant coffee and whisk it together. Add the milk, oil, egg, and vanilla to the dry ingredients and using the whisk mix it together until just combined. Slowly add the hot coffee and mix until smooth making sure to get the batter off the sides and bottom of the bowl. Using a scoop fill each cupcake liner to about 3/4 full. Bake in preheated oven for 14 – 17 minutes or until a toothpick inserted into several cupcakes comes clean. Cool the cupcake for a about a minute in the pan then move to a cooling rack to finish cooling. In a medium saucepan, combine the flour and coconut milk whisking constantly over medium high heat until mixture becomes very thick. It will be pudding like in consistency. Remove from heat and whisk in the vanilla and coconut extract. Cover with plastic wrap directly over the “pudding” to prevent a skin from forming. Allow it to cool completely. In the bowl of a stand mixer fitted with the whisk attachment, whip the butter, sugar, and salt together until smooth. Scrape down the sides of the bowl and add the cooled milk/flour mixture to the butter. Mix on medium high speed until light and creamy, scraping down the sides of the bowl a few times making sure to get the bottom of the bowl. Fold in the flaked coconut. Using an ice cream scoop, frost each cupcake with a scoop of frosting and enjoy!